You might say our founder is a "glass half full" kind of guy. During his Orlando vacation planning, when he learned just how difficult it is to find reliable, affordable ground transportation from the airport, he figured there must be a better way – but, actually, there wasn't. Not until he started Orlando Shuttle Service. What Rick found years ago as he tried to arrange transportation for himself and his son from the Orlando airport to a hotel near Disney World was that prices were hard to pin down – and sometimes appeared to be deliberately unclear. It was hard to tell whether the price of a shuttle fare included tax, surcharges and tolls – all of which can really add up! Sometimes, he couldn't even get a straight answer when he called companies to ask about extra fees. He looked into renting a car, and found he could get a sub-compact model for $465 for his weeklong vacation – and that price didn't even include tolls, gas or the cost of parking. Always the optimist, he was sure he could find a cheaper option. And indeed, cab fare would have been cheaper – $120, round-trip, between the airport and Disney – but that didn't include tolls or gratuity. 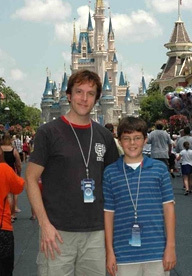 Even though Rick had found some great hotel deals outside Disney World, he ultimately decided he and his son would stay at a Disney resort, so they could use the "free" resort transportation from the airport. But he ended up paying $160 more for lodging, just for the convenience of getting there with no hassles. "This is ridiculous," Rick said to himself (and possibly to his son). "There should be a better way to find transportation." And so Rick decided he'd do his own research on shuttle fares and create a searchable database that would allow people to compare prices. He started building relationships with area transportation companies and quickly learned who was known for dependable, friendly service. That's how Orlando Shuttle Service began, and the transportation providers you'll find on our website today were hand-picked by Rick himself – you won't find any shoddy shuttles here. Whether you're heading to Orlando for a family vacation or for business, you're going to need transportation. So when you search for fares on our website, you'll get a range of results – cheap shuttles, private town cars/luxury sedans, limo service – we've got options for all types of travel. And the fares you see include all the taxes, tolls and surcharges. Here's something else you'll find on our site: some exclusive rates that you can't find anywhere else. Sometimes, those special deals are so good, that you can afford more car for your money – and why would you take a shuttle, if you can get a private town car for the same price? It's easy to search for fares – just use our online form to choose where you're coming from, where you're going and how many people are in your party, and you'll get an instant list of results. Then you can reserve your ride online and arrive at the Orlando airport knowing your transportation needs are covered. Rick's work didn't end after he built that database way back when. He's always looking for ways to offer travelers even more – for example, it was his idea to redesign this website to include more insider tips on Orlando travel. And check out our budget calculator for even more help with your Orlando vacation. Any time you're heading to Orlando, know that you'll find the best deal for the best service when you make your reservation through our website. So search our fares today, and book a ride you can trust.